Also known as the ‘Burning Bush’, Euonymus alatus is a medium sized shrub that grows well in Australian conditions. Known both as the ‘Spindle Bush’ and ‘The Burning Bush’ this is a drought tolerant plant used for it autumn colour. Originally from China, this is a plant that will withstand the rigours of the hot Australian summer with few problems. 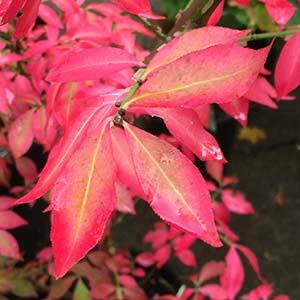 This is a deciduous shrub and the autumn foliage is brilliant reds and crimsons right through from early autumn. One of the best shrubs for autumn foliage. Widely used as a hedging plant, in the garden border or as a feature plant in shade where in comes into own in autumn. Try underplanting with autumn or spring flowering bulbs. Try a humus rich soil that is well drained yet retains some moisture. A position in full sun is Ok, however we prefer to grow Euonymus altus is dappled shade. It performs better in these conditions and will still have brilliant autumn colour. Euonymus altus is easily pruned to shape and size if required. The best time to prune is in early spring. Euonymus altus compacta – Smaller growing to around 2m with a similar spread. Height – Will reach 2 – 3 metres although compact cultivars will be at around 2m. Position – Full sun to a dappled shade. Bark – Winged and Cork like. Flower Color – Insignificant small yellow to green. Foliage – Deep green tuning to red and crimson in autumn. Euonymus alatus is available for sale from the following nurseries.